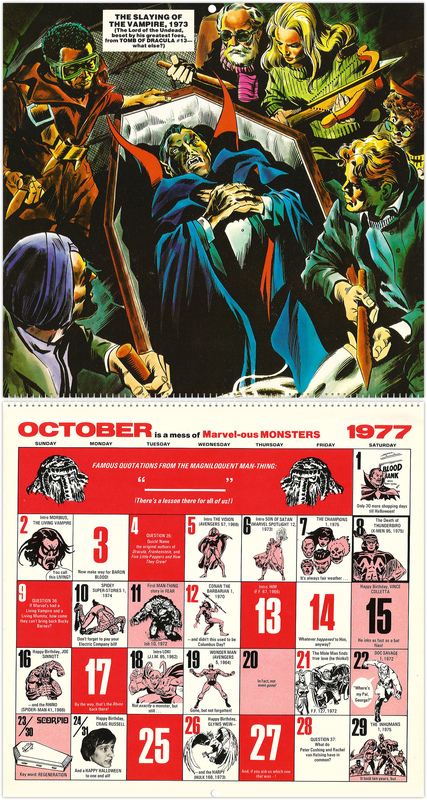 Marvel Comics Memory Album Calendar 1977 | 'TAIN'T THE MEAT… IT'S THE HUMANITY! 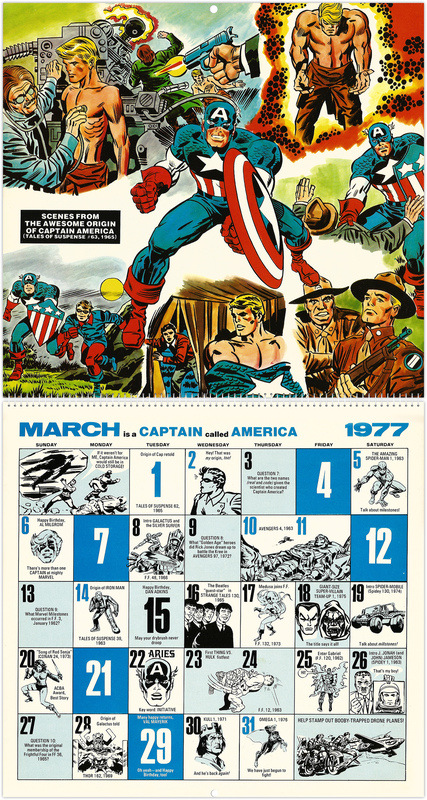 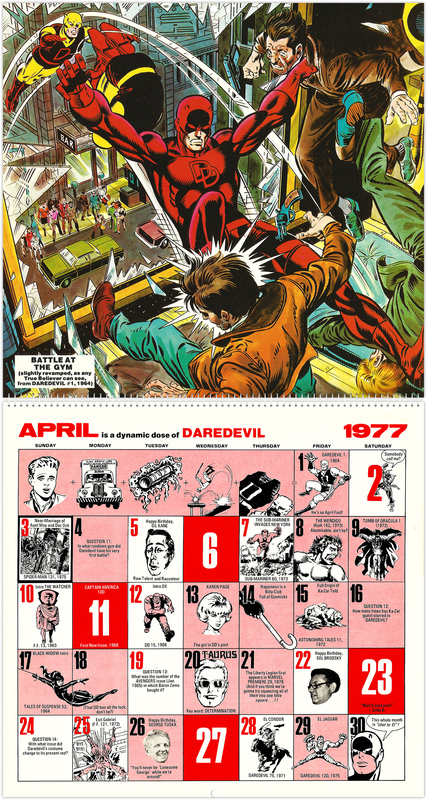 Marvel Comics Memory Album Calendar 1977 was the third calendar published by the comics giant, and included artwork by some of their biggest stars, as well as staff birthdays, fun-facts and trivia questions. 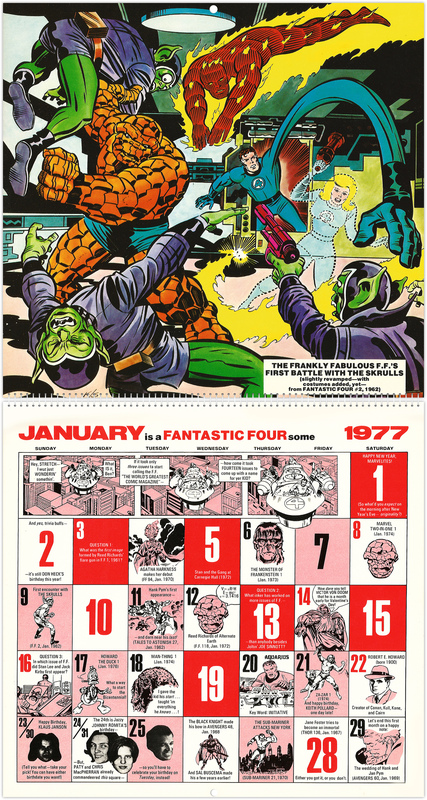 Between 1975 and 1981 Marvel Comics released seven calendars that featured artwork of their most popular superheroes by some of the company’s most popular artists. 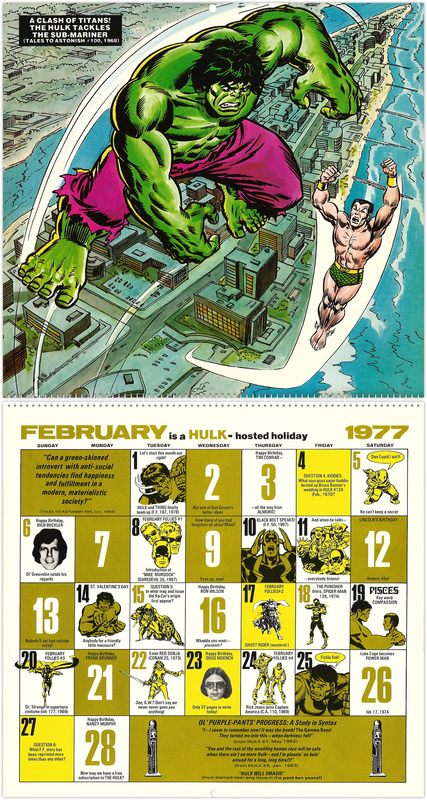 Each spiral bound calendar sold for under $5, measured 11½ x 11 inches and featured 1977’s calendar dates along with 12 new full-colour illustrations. 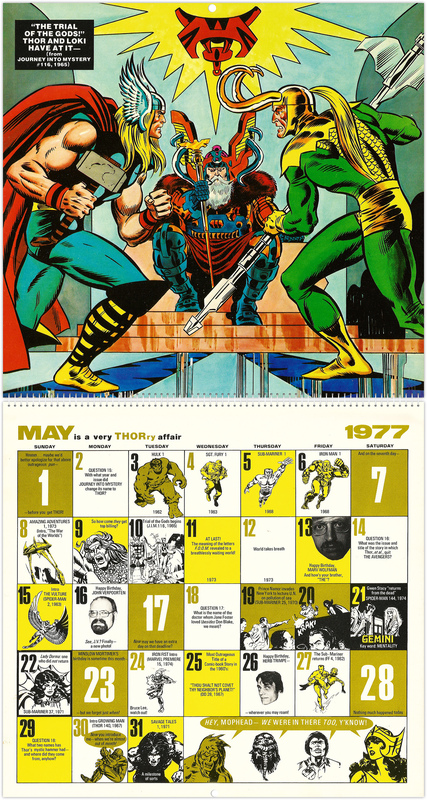 Also included were small reprinted pieces of line artwork, along with black and white photos of Marvel Bullpen staffers along with their respective birthdays. 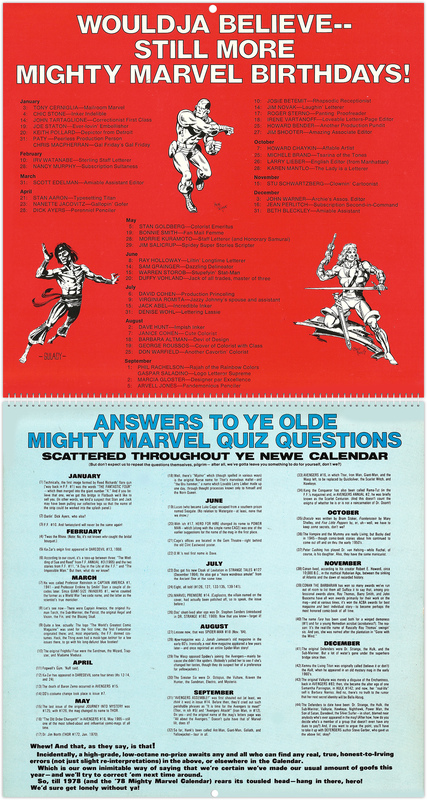 In keeping with the memory album theme also included were dates of some memorable moments from Marvel’s publishing history as well as trivia questions (with the answers printed on the inside back cover). 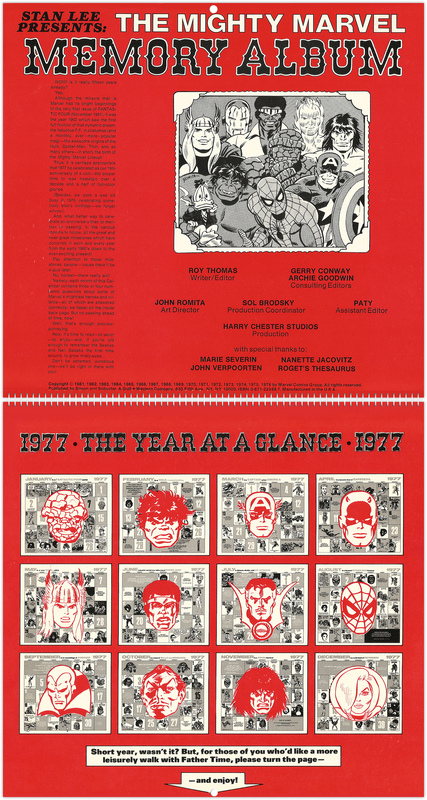 There was an introduction page, 1977 ‘at a glance’, and a page listing even more Marvel staff birthdays. 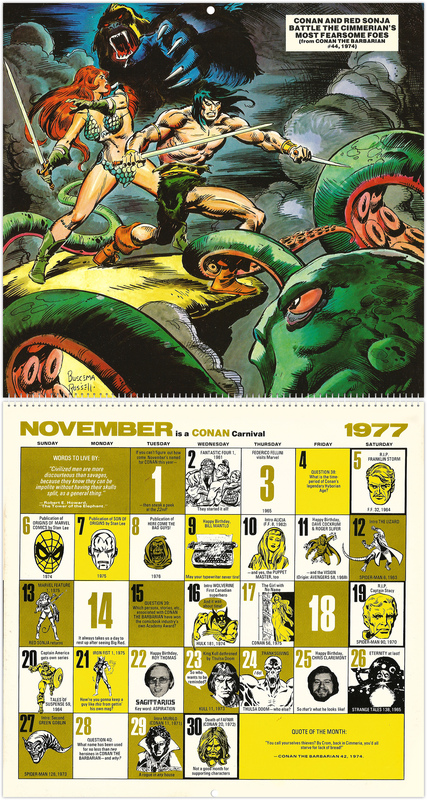 This 1977 calendar featured a large selection of Marvel’s most popular characters, including Spider-Man, Captain America, Thor, The Fantastic Four, Daredevil, The Hulk and Conan the Barbarian. 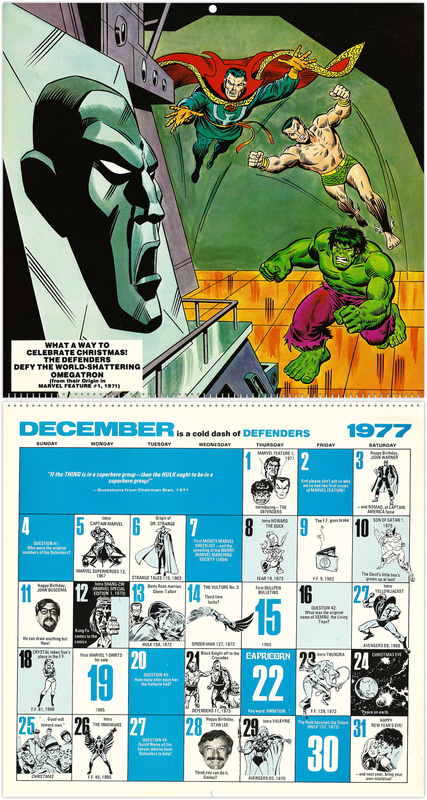 Artists who contributed to the calendar included Jack Kirby, John Romita Sr, Gene Colan, George Perez, John Buscema, Sal Buscema, Gil Kane, Ross Andru and Ron Wilson. 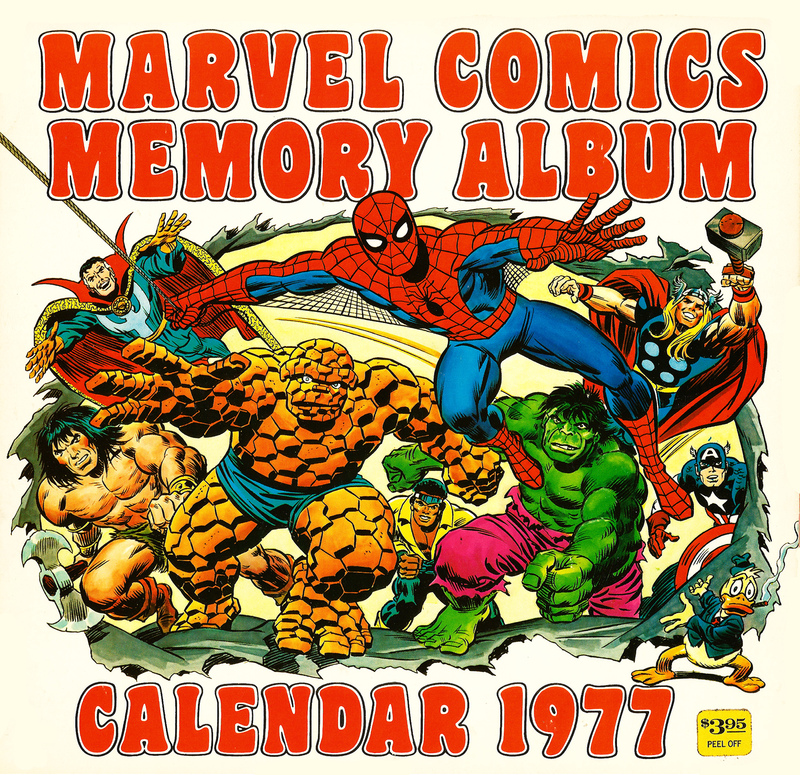 The cover was pencilled by Kirby and inked by Romita. 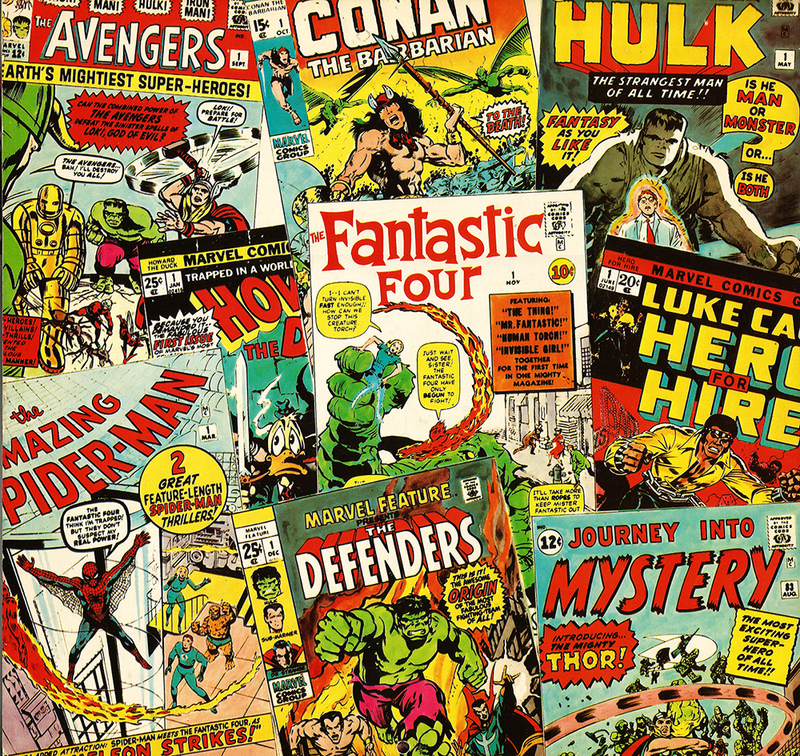 Each of the 12 illustrations recreates a key moment from Marvel’s publishing history, along with a brief description and issue reference. 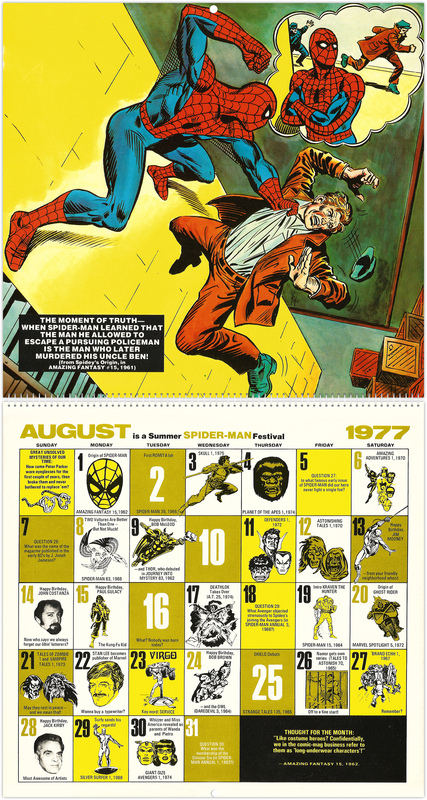 Although the calendar was published by Simon & Schuster, it was actually produced in-house by the Marvel Bullpen, and featured the same self-depreciating and irreverent humour that Marvel fans had come to expect from the company. 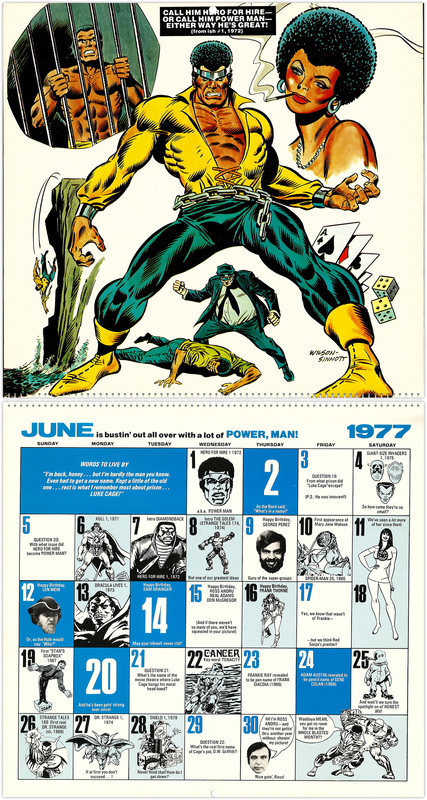 The inclusion of staff photos, although not new to the Marvel Calendars, was always welcome although the crude black and white printing didn’t do some bullpen staffers any favours: Frank Robbins (birthday 7th September) looks somewhat creepy and — judging solely by his photo — I wouldn’t want to meet Herb Trimbe (26th May) on a dark night. 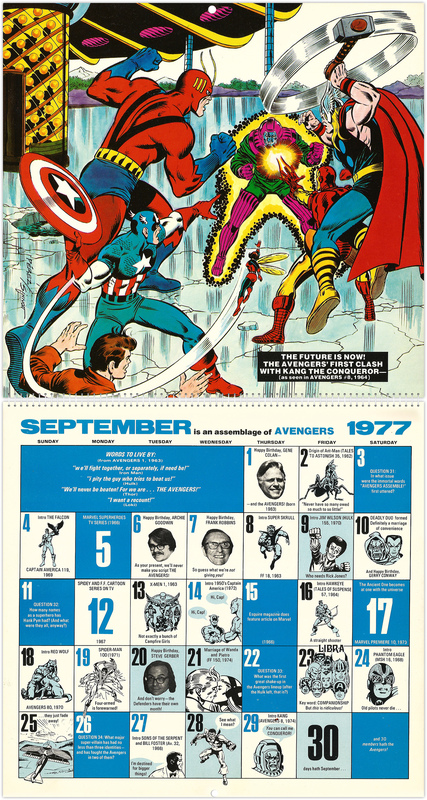 Here are all the pages from the Marvel Comics Memory Album Calendar 1977. 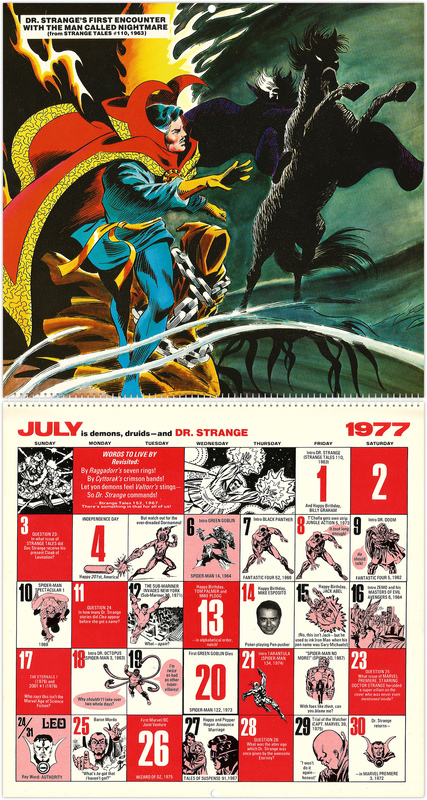 For those still in the calendar mood I’ve already looked at four other Marvel Calendars — Mighty Marvel Calendar for 1975, The Mighty Marvel Bicentennial Calendar 1976, Marvel Comics Calendar 1980: The Occult World of Doctor Strange, and Marvel Comics 20th Anniversary Calendar 1981.